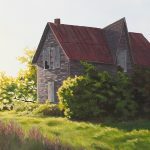 It was on one of those unusually warm and sunny days this November that I met Ken Veitch and Bill Shea at the “White House”, Ken’s childhood home in Ufford, Muskoka. In the summer, the old double peaked house is barely visible from the road due to the dense overgrowth and brambles. After the leaves have fallen, a whole world opens up and objects and windows emerge in the sunlight. The “White House” has been empty for close to 30 years and the seasons of disuse show in its rotting floors and bulging walls. The foundation on one side of the building is crumbling. One day the weight of snow will bring it down. But for today, we had double digit temperatures and the house glowed with golden light. The two peaks of the house were created by moving two different buildings together. The western (left) half of the house was where most of the living went on. The kitchen and living area were right in the main front door. 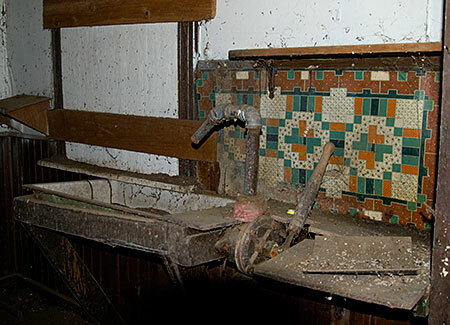 The sink and the pump, the stove, an old hand made couch and the kitchen table filled this front room. Ken’s uncle would be struck by lightning through the kitchen pump – an experience he would suffer more than once in his lifetime. Perhaps that was responsible for his tremendous talent for reciting Robert Service? Bill, Ken and I lingered in this room, talking about the conversations and the mundane goings on that would have happened in this area of the house in those early days. The sun coming in the window caught the dust we had stirred up as fully as the memories. Behind this main room are the utility room/pantry and the the only main floor back bedroom. Ken said this tongue and groove wood room was used as a post office when he was very young. He mentions hiding in the post sacks as a child. In later years, he remembers the first electric radio at the farm that had numbers that glowed. The sounds of the outside world emanated from this remarkable device in that pine lined back room. We made our way up the narrow stairway that was, unusually, right in the center of the wall. It made two turns and opened into a large, dark hallway with a very low railing over the stairwell. 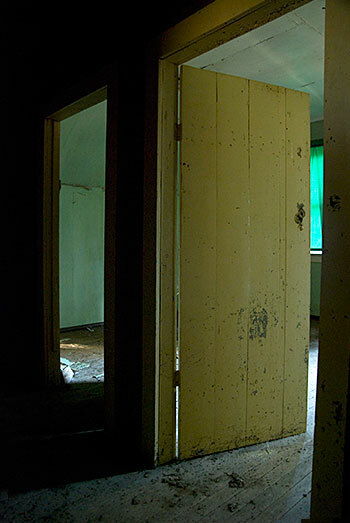 Three doors came off the hall, one to the back when Ken’s sister, Anne, stayed. Two other doors entered into a single front room where the stove pipe from the kitchen once came through. Ken stayed on the east end of this room. 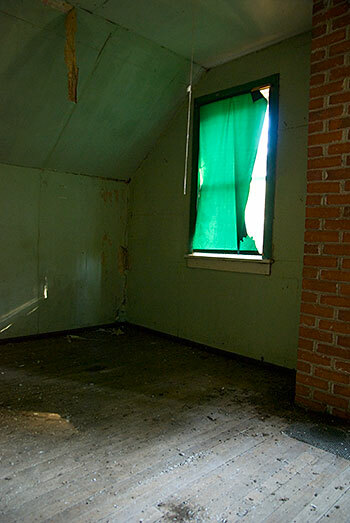 Again, like in a number of Muskoka houses I have seen, there is teal green in this room, filtered through the blind. I am beginning to wonder why teal blue and teal green were such popular colours? The second floor was devoid of furniture. Only a few curtains and blinds had been left behind and a solitary picture on the wall. 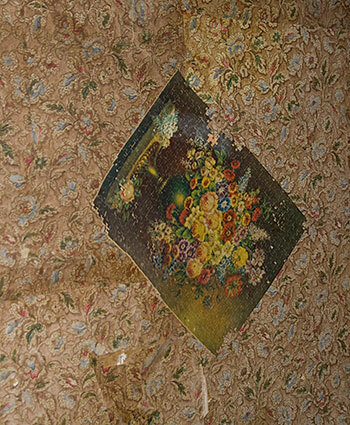 Upon close inspection, the picture of a vase painted in 19th century classic style was, in fact, a puzzle. We moved back down the stairs and into the eastern side of the house. 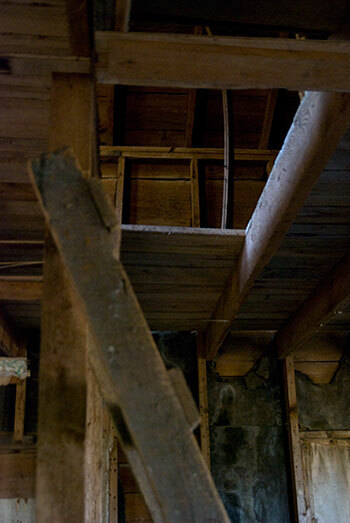 The hardwood tongue and groove paneling had long since been torn off leaving the main floor open and without partition. It was in this room Ken shared his earliest memory. He was two years old and standing on his grandmother’s feet, he peered over the edge of a box. In it laid a woman with her hands crossed. He was too young to emotionally understand that this was his mother and that she had died. From the letter from her doctor that is included in Ken’s memoir, it would appear she died of kidney failure brought on by too many pregnancies. We went on the explore the rest of the east side where remnants of old military cots and maple syrup filters were strewn over the floor. 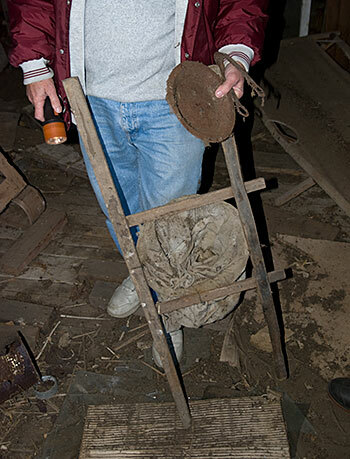 In the attic, there was plenty of evidence of the occupation of bats. On the main floor there was a hole down to the cellar. This, hole often took on another purpose on very cold nights…! Ken shares a story of getting caught because someone was actually in the cellar while the hole was being used and it is a funny one. I’ll leave that for Ken to tell in his book! Before returning to the year 2009, we ventured into the back yard where we found tonnes of ketchup bottles in the old trash heap. Ken stood near the front corner of the house and reminisced about the apple tree that used to stand there. He had tied a ball to the tree in order to practice his baseball swing. Near the back of the house was an overgrown path to the barn and where the old pig sty used to be. We stood in the still November air and, for a moment, past and future rolled together. We tuned ourselves to the quiet and almost imperceptibly slow aging of the building beside us. A cat crawled through the logs curious about our presence and then disappeared. Ken has written a memoir on his life in Ufford as a child and as a young man. Many of the stories here appear in greater detail in his book available from Reader’s World in Bracebridge, the Book Store in Gravenhurst and from Ken himself. It is an entertaining and moving read about life in rural Muskoka from an earlier time. What an interesting account. 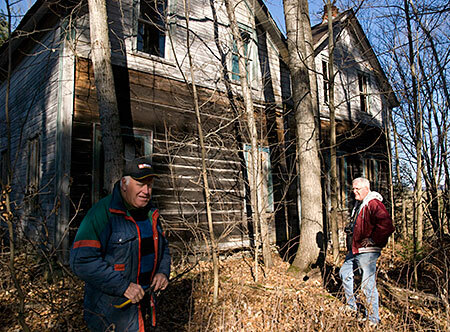 Your fascination with old abandoned houses is catching. The UK is now so crowded that all old houses are occupied at once by squatters or torn down to make way for new ‘ticky-tacky’. 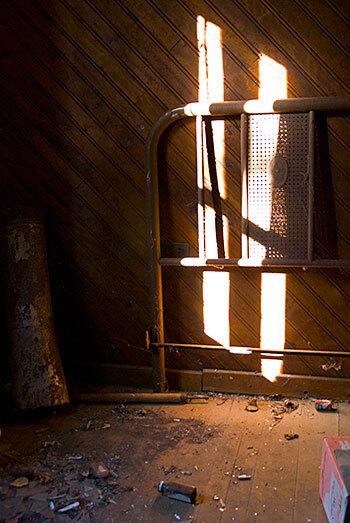 You have a good way with light shafts and colour, the latter especially in “upstairs”. That is quite a first memory of his mother! 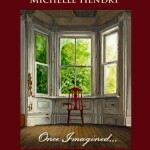 I enjoyed this post very much Michelle…old homes hold such stories! Great story, well told in words and pictures. You get into the thick of things historically; thanks for sharing this glimpse into our past. Dear Michelle, This was FABULOUS!!! You have shown single photos of old houses, but to have a whole tour of this place kept me spellbound right to the end. And even then I was hungry for more. WOW!! 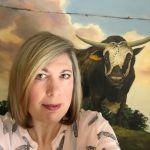 Not only are your photos (as always) STUNNING and totally capture the FEEL of these places, but your writing was poignant, fun, fascinating and eloquent. You know I love these old houses just as much as you do. I find them so fascinating that it almost like a mania, in that no matter how many I used to explore when lived in Maine I t was never enough. 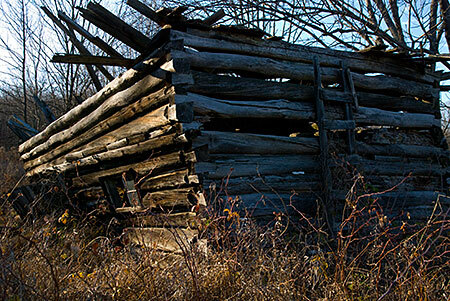 I also loved exploring the old dumbs that were often right next to farmhouses. I found so many antique cobalt blue bottles and other very old bottles. Love collecting them. Still have many on my widow sills. Used to make mosaics out of the beautiful old pieces of broken china I would find. It was SO lovely with delicate flowered patterns and birds. For me it was like finding gold. 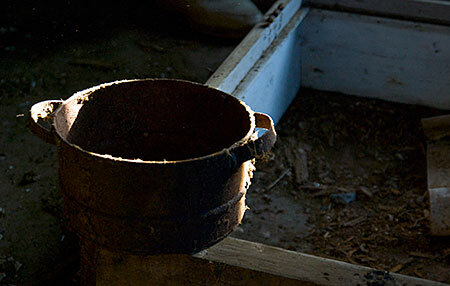 Sometimes I would find old cast iron ladles (probably used to dip water) or cast iron pots. Other times I would find very old cutlery, snuff boxes, buckles and so forth. For me it just soooooo much fun. Thank you for taking the time to photograph all this step by step, just a beautiful article and photos. I especially loved the kitchen with pump and tiled wall section and lightning story. Oh and the old puzzle on the wall. Absolutely a wonderful post michele..
scene of their experience…what a moving experience for you[ and them I suspect]. Thanks for caring enough to make the effort to preserve these memories. You have a well thought and lain out chronology with really quite good photo documentation. My great pleasure to view and experience.